It’s been eleven years since the last arts assessment from the National Assessment of Educational Progress (NAEP), known as the “Nation’s Report Card.” NAEP is also widely viewed as the gold standard of educational assessment. 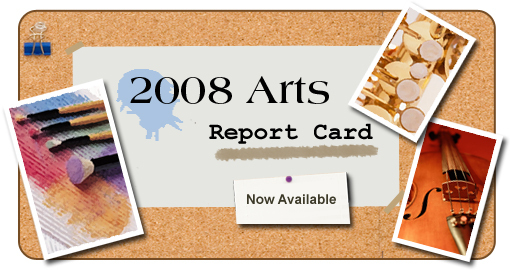 On Friday June 15th, the 2008 “Arts Report Card” was released. Before I get into anything else, I do have to say how important it is that NAEP includes the arts. While there will be big and small issues to debate, the effort here is important and hopefully something that can be done again in less than 11 years, while being improved upon greatly. Here’s the link straight to the NAEP website. Here’s a link to the NAEP Commissioner’s remarks. Here’s a link to Secretary Duncan’s statement on NAEP. should do better for America’s students. Way to go Mr.Secretary! Let’s all keep that statement in mind when it comes to “Race to The Top” funds from the USDOE. 2. NAEP did not look at theater or dance. 3. Purely In terms of access, NAEP looked only at what was offered to students sampled, and found that there wasn’t much change in the provision of art and music at the 8th grade level. 5. NAEP sampled a total of 7,900 eigth-graders nationwide, assessing half for music and half for visual arts. 1. It’s good thing that this is revealing important issues concerning quality of instruction in art and music. 2. It appears to do a disservice to the equity and access issues by giving the impression the arts are holding their own over the past 11 years. While the access may appear relatively static in the sample, without getting into great details, it’s lacking the relevant and necessary context of what’s transpired over the past decade. A great deal of work has taken place since 1997 to restore arts education. If you consider that after all that work, that the arts are in the same place on the basis of access, well, that’s much, much worse a situation than is indicated in the report. And of course, there’s plenty of missing context in terms of what students should be receiving. And, let’s remember that the report relies on what administrators report concerning what is offered to students. This is the Achilles heel of most of these reports. We do not know what the kids are actually receiving. So, for those crowing about how this proves the curriculum hasn’t narrowed as a result of NCLB, they better think again. More to come, as I haven’t had a chance to really kick the tires here. Here in New York City, middle school only 46 percent of middle school students are provided with the minimum arts requirements according to New York State Law. That means that we cannot find the means to provide a total of 108 hours of arts instruction across the middle school grades for each and every student. Why does the NAEP continue to exclude theatre and dance? As a result, their study doesn’t measure “arts education.” This claim drives me crazy every time the study comes out. It measures “visual arts and music education,” still a worthy goal but hardly inclusive of the core fields in the performing arts.